This week, Stephen visited the Royal College of Physicians of Edinburgh (RCPE) Sibbald Library. Iain Milne, the Sibbald Librarian, gave a party of visitors a tour of the facilities. This was organised by Edinburgh Library and Information Services Agency (ELISA) Staff Development Group. The RCPE was a society of medical practitioners who began meeting up to agree standards of good practice and thus improve the profession. The Library has been in existence since 1682, just one year after the RCPE’s formation, and was intended to provide a literature resource of the most current medical theory and practice. The Library moved to its present location in Queen Street in the 19th century and continued to be a contemporary resource until the 1960s, when this status was gradually eroded by the free availability of medical journals from the United States. Since the late 20th century the Library has mainly been used as a historical resource. It is housed in an A listed building of beautiful wooden panelling, balustrades and marble statues. Alison Scott, Archivist, explained some of the work she has been doing. The Wellcome Trust have funded a project to catalogue the archive collection, which includes international correspondence and notes regarding the diagnosis of patients by the famous 18th-century physician, William Cullen. A University of Glasgow project is digitising the Cullen papers and it is planned that they will be available online next year. Alison worked at LHSA until earlier this year so the visit was a good opportunity to see where she has moved on to. Visits to other libraries such as these are important as it means that LHSA staff have a better awareness of what other local resources on medical history are available, and can direct archive users to exactly the information they need. 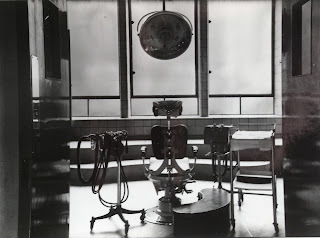 Many records in LHSA were produced by Fellows of the RCPE, therefore there is considerable crossover between the collections of the RCPE and LHSA. To find out more about the RCPE Library please see http://www.rcpe.ac.uk/library/. “The days are dark and fateful. As a nation we carry on under the devastating realities of a world at war…our Hospitals, more than ever as sanctuaries of healing and restoration, are prepared to render the uttermost service to the maimed and injured, thus saving lives and bringing immediate relief to stricken humanity…Meanwhile, the call comes to all within the Infirmary’s region and sphere of service to help to sustain this great work on the home-front in keeping with the courageous spirit of the times”. You may have guessed that Russell Paton’s Communications Team didn’t ask him to condense his message into 140 characters or less. Thankfully the Organising Secretary of the Royal Infirmary of Edinburgh wasn’t tasked with communicating to the Twitter generation but with writing a foreword for ‘Our Record of Service’, a souvenir brochure published by the Hospital in 1941 which we have accessioned into the Archive this week. 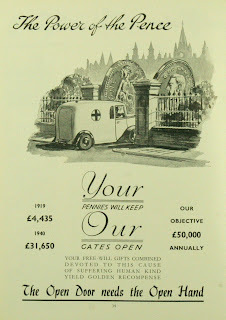 At that time “the largest voluntary hospital in the Empire”, it published this booklet to celebrate its efforts on the home front during WW2 and to encourage readers to contribute to its funding. 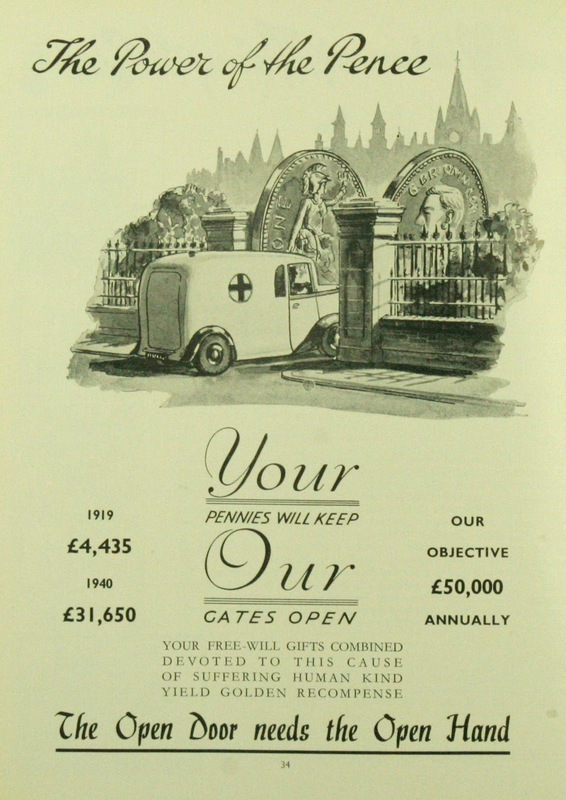 At a time before the introduction of the National Health Service, all of the pennies raised counted. 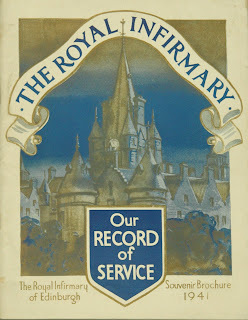 Priced at 6 pence “or whatever more you can afford”, it contains messages from the Lord Provost, the Board of Managers, nursing and medical staff about the importance of the Hospital within Edinburgh and Scotland. The articles describe the work of the League of Subscribers, the numbers of patients treated annually and where they came from. Alongside these are beautiful illustrations, including a cartoon by the notable artist Tom Curr. There are poems and even a look at what the future maternity services of 1991 might look like. If you’d like to view the booklet, or any other parts of our collections, please contact us. This week Mariko Wanatabe leaves her volunteer position with LHSA after working with us for a day a week since March 2010. 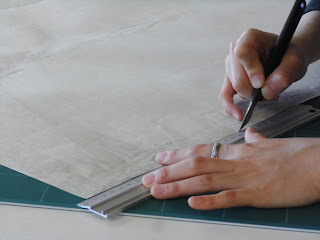 In that time Mariko has been trained by Ruth, the Paper Conservator, in basic cleaning, repair, pressing and re-housing techniques and has worked on a wide range of LHSA collections under Ruth’s supervision. Mariko has helped check and house new accessions, and provide long-term storage for some of the objects. 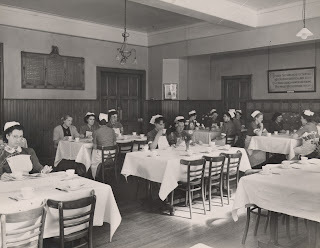 She has surface cleaned, repaired and re-housed architectural plans, and humidified and pressed loose sheet hospital staff records, which have then gone on to be catalogued. ﻿Mariko’s volunteer work has provided her with some excellent experience for her future career in conservation and has also helped support one of our core services – ensuring that the collection remains in good condition and is accessible for future research. Mariko leaves us to take up a place at West Dean College to train to be a book conservator – we wish her all the best and hope to see her again when she is next in Edinburgh! We’re also delighted to announce that the ‘Unsung Heroes’ exhibition in the CRC’s display wall has been extended until 28 October 2011. New artworks by Edinburgh College of Art staff and students are exhibited alongside the items from LHSA’s collections that inspired them. The exhibition is free, and open 9-5pm Monday to Friday in the Centre for Research Collections (Edinburgh University Main Library, 30 George Square, EH8 9LJ). 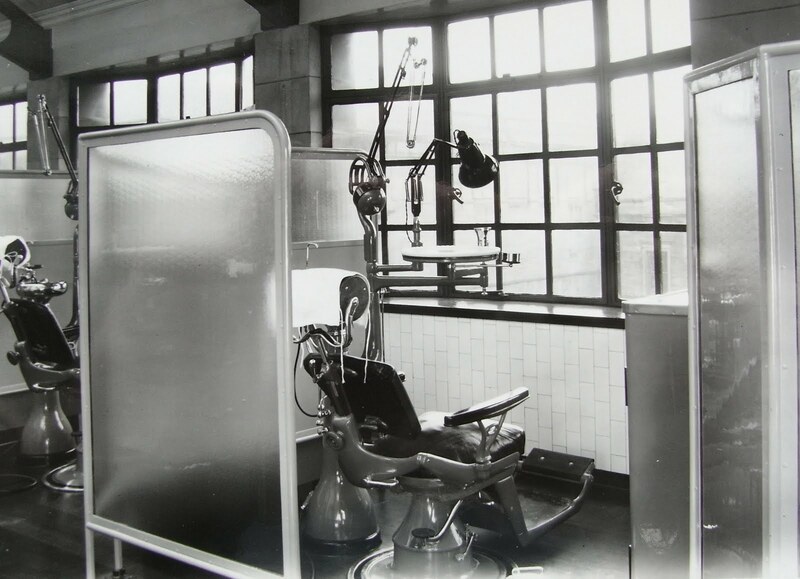 We have recently completed the cataloguing and re-housing of a folder of photographs from the Edinburgh Dental Hospital and School (our ref: LHB25). These mainly date from the 1950s and feature a variety of views of, what were then, brand new facilities in Chambers Street. Each photograph has been described and given a reference number in a catalogue. The photographs feature dental treatment rooms, lecture theatres, the waiting room and a great variety of medical equipment. ﻿﻿The images present efficient, clinical workspaces and a distinctive feature is the use of frosted glass screens to enable as much natural light through as possible, whilst retaining privacy for the dentist and patient. A Dental Hospital and School was established in 1878 in Brown Street, now Chambers Street, by the Edinburgh Dental Dispensary in co-operation with the Scottish Dental Education Committee, and apart from a move to Lauriston Place from 1889-1894, remained on this street until its closure in 1994. To conserve the photographs, each one has been placed in a protective polyester-based Melinex© sleeve within an acid free archival box, with the reference number attached to each sleeve. In this way the photographs can easily be accessed and identified when an enquirer requests an image on a particular subject. This week has seen the Archives and Records Association annual conference taking place in Edinburgh. The theme is ‘advocating for archives and records’, a highly relevant topic in this time of cutbacks. LHSA staff have all attended at least one day of the conference and found the presentations to be stimulating and thought-provoking. It was great to see how archives across the world are engaging with their users, arguably advocating the importance of their records through both traditional means and new social media, creating a community of users who in turn value and advocate for the archives. One of the key messages from a duo of French archivists was that in this age of information overload, an archivist’s skills of finding the right thing at the right moment are more relevant than ever.